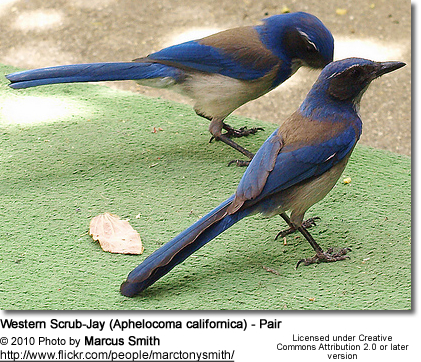 The Western Scrub-Jays (Aphelocoma californica), also known as Long-tailed Jays, are scrub-jays found in western North America. Their range extends from southern Washington south to central Texas and central Mexico. 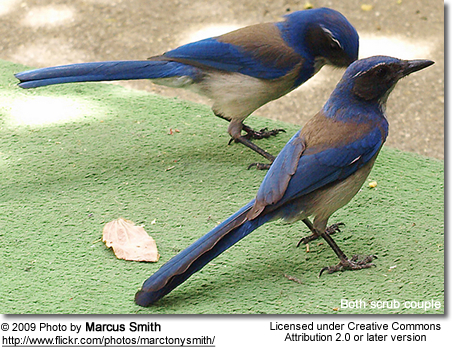 These blue-and-grey plumaged birds are sometimes referred to as "Blue Jays" resulting in confusion with the true Blue Jays, which belong to a different family. The food-caching behavior of these intelligent birds has been the subject of several studies. These birds plan ahead for times when food isn't readily available. This ability was previously thought to be unique to humans. Scrub Jays bury excess seeds and nuts beneath leaves, grass or mulch; and will retrieve them when food sources in their environment are scarce. They may also hoard and bury brightly colored objects found in their environment. According to research, their brain-to-body mass ratio rivals that of chimpanzees and cetaceans (ie. whales and dolphins). 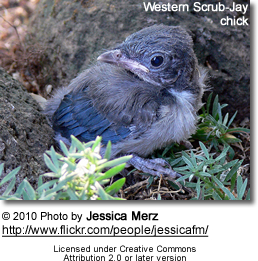 Blue Jay Funerals: The University of California, Davis reported an odd behavior of Western Scrub Jays that is not typically associated with animals. These birds appear to mourn the loss of flock members. These jays will loudly screech near a dead jay for as long as 30 minutes and remain close to the body for a day or two. Similar behavior was reported from the extinct Carolina Conures - who flocked around injured or dead flock members (often wounded or killed by hunters) in a manner that suggested mourning. This predictable behavior made these birds easy targets and contributed to the extinction of that species. Cooperative relationship with large mammals: Mule deer have been observed allowing scrub jays to hop over their bodies and heads as they search and feed on parasites, such as ticks. The deer appeared to facilitate the process by standing still and holding up their ears to provide easy access to the jays. 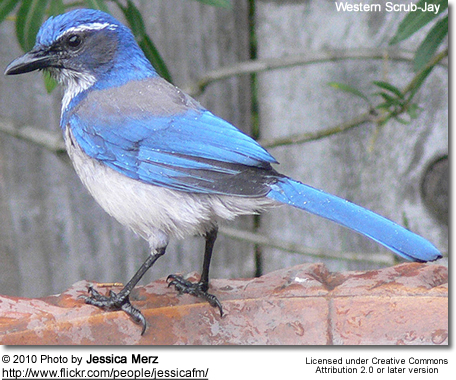 Western Scrub Jays are resident (non-migratory) within their range, which extends from southwestern Washington to southwestern Wyoming, Colorado, and central Texas south through the southwestern United States to southern Baja California and Oaxaca, Puebla, and west-central Veracruz in Mexico. Vagrants may occur as far north as southwestern British Columbia in Canada. They inhabit scrubby woodland and chaparral, favoring pinyon, juniper and oak trees. But they may also occur in mesquite bosques or suburban gardens. 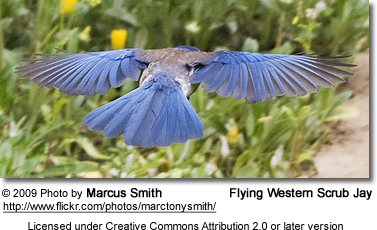 Coastal populations have brighter blue upperparts and whiter throats than those found in the interior. Coastal birds also have a strongly defined blue chest band, which is indistinct and typically incomplete in interior birds. The members of the California and Sumichrast's have strong bills that are hooked at the tip, which are well adapted for feeding on acorns. The members of the Woodhouse group have slimmer, longer and straighter bills with little or no hook. Range: Central California Coast from San Mateo County and southeastern Alameda County south to southwestern Ventura County. Recently have expanded their range north into the Puget Sound region of Washington. ID: Large subspecies with well-defined breast band. Mostly feeds on acorn. Physical Differences: Grey plumage, less contrasting chest band. Taxonomy: Sometimes considered a different species. Range: Rocky Mountains foothills, from northern Utah and southern Wyoming south to northern Chihuahua in north-central Mexico and western Texas. Range: Range limited to the single-leaf Pinyon forests on Eagle Mountain in Joshua Tree National Park in arid southeastern California. Range: Southern Mexico from southwestern Oaxaca and Central Guerrero. Separated from ssp. sumichrasti by the Rio Balsas valley. 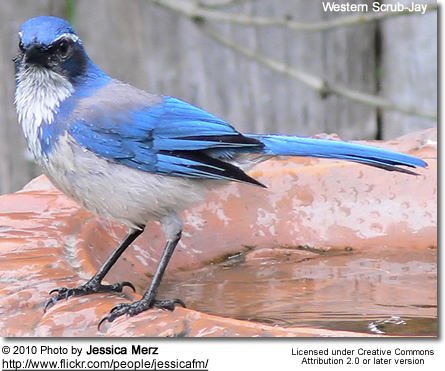 The Western Scrub Jays and the Pinyon Jays are the only larger blue birds found in western USA that don't have a head crest. Mexican Jays: All-blue back. No collar. Western Bluebirds and Lazuli Buntings: Considerably smaller size. Shorter beak, tail and legs. 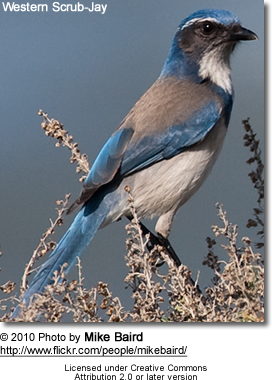 The diet of the Western Scrub Jays varies by season. fruits, insects, spiders, snails, rodents, reptiles, frogs, and the eggs and nestlings of smaller song birds. At any time of the year, they may visit bird feeders for sunflower seeds, peanuts and corn. They can become quite trusting in urban settings and are known to be easily trained to eat treats (such as peanuts) off human hands. They will also feed on fruits and vegetables grown in gardens and fields. Outside the breeding season, these jays forage in pairs, family groups or very small flocks. They tend to be aggressive towards other birds, and have been known to steal hoarded acorns and other food items from other birds. These smart birds cache excess food at scattered locations within their territories for retrieval at a later stage (typically at a time when food sources are scarce - such as during the winter). Their accurate and complex memories enable them to recover hidden food resources even after long periods of time. 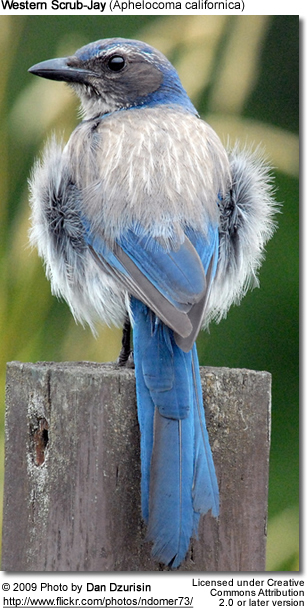 Western Scrub-Jays are typically monogamous, but will seek new mates if their previous was lost. Most nesting occurs between March and July. The females construct the nest with assistance by the males. The sturdy, basket-shaped nests are made of twigs, dry grasses and moss; and the interior is lined with rootlets, fine fibers, feather down and mammal hair. 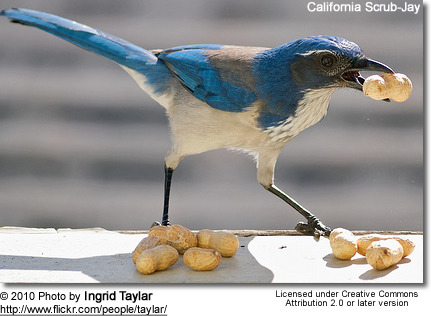 The outside dimensions of Scrub-jay nests are about 13 - 23 inches (33- 58 cm). It takes about 10 days to complete a nest. Nests are built low in trees or bushes as low as 3 feet (0.9 meters) up to 33 feet (10 meters) above the ground. However, most of them are between the range of 6 - 14 feet (1.8 - 4.3 meters) in oak, pinyon-pine or other trees or shrub. Nests are generally well concealed in foliage, vines and mistletoe. The female lays as few as one up to as many as six eggs that vary in color from pale green to pale greyish white irregular, olive-colored or reddish-brown spots or markings. Each egg measures about 0.9 - 1.3 inches (2.4 - 3.4 cm) in length and 0.7 - 0.8 inches (1.9 - 2 cm) in width. The female incubates the eggs for 15 - 17 days. The hatchlings are blind and naked. Both parents feed and protect them. The young fledge (leave the nest) when they are about 17 - 19 days old and they remain with their parents for about five months. Pairs usually produce one brood a season. Their varied vocalizations are can be harsh, nasal cheerps and chattering calls. They are rendered as "jay", "jree", "check-check-check." 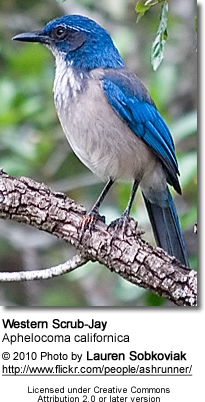 The average lifespan of a Western Scrub Jay is about 9 years, but some wild birds have lived 15 years or longer. 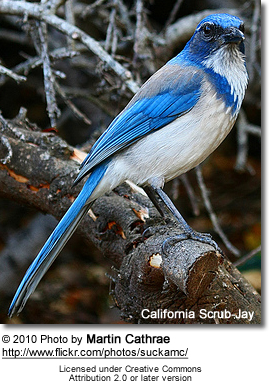 The oldest reported Western Scrub Jay was a captive bird called "Aaron" who was found in Castaic, CA in 1991 and was raised in captivity. Aaron lived 19 years and 8 months.